A simple, but useful Windows Virtual Desktop program. Virtual Desktop for Windows extends the size of your display beyond the boundaries of your physical screen. With Virtual Desktop for windows, virtual desktop space can 1 to 8 times wider and 1 to 8 times higher than your display can see at one time. The virtual desktop window allows you to move your display around the virtual desktop so that you can see its different parts. The virtual desktop window also allows you to move your application windows around on the virtual desktop. The virtual desktop window lets you manage the virtual desktop. It displays a scaled-down version of the entire desktop and shows you graphically where your windows are and what part of the desktop your display is currently viewing. The color of the background in this window will be the same color as your Windows desktop (however bitmaps on your desktop are not displayed in the window). All visible windows are displayed except for the desktop window itself. This includes minimized windows. All windows that are not minimized are displayed as rectangles with their current titles across the top (at least as much as will fit). Active windows are displayed in the active title bar color and the active title bar text color. Inactive windows are displayed using the inactive title bar color and text color. The current view rectangle is displayed as an outline in the highlight color. If grid alignment is enabled (see Setting Options), the grids are displayed as dotted lines in the window frame color. You may move application windows with the left mouse button. Position the mouse pointer over the window you want to move, press the left button, drag the window, and release the button. A rectangle will be shown as you drag the mouse showing you where the window will go. Also, the caption of the virtual desktop window will display "Moving xxxxx" where xxxx is the name of the window. The window will move to its new position as soon as the mouse button is released. With icons, you may drag either the caption or the icon and both will move. Note that these are actually separate windows! And, of course, you can always move windows by dragging them around the screen the old-fashioned way and the virtual desktop will track this movement. Note however, that the Windows desktop will not allow a maximized window to be moved. The only way to move a maximized window is by dragging it in the virtual desktop window. The Windows desktop may be moved around in the virtual desktop by holding down and moving the right mouse button in the virtual desktop window. A rectangle will appear showing you where the desktop will be positioned when the mouse button is released. Also, the virtual desktop caption will change to "Moving Desktop". As soon as the mouse button is released, the Windows desktop will be moved to the new location in the virtual desktop. The virtual desktop window will move with the Windows desktop, while all others remain in their old positions. The interesting thing, for those of you who care, is that in fact it is neither the Windows desktop window nor the virtual desktop window that are moving. In fact, these are the only things that don't move. When the desktop is moved about in the virtual desktop, you are actually moving THE VIRTUAL DESKTOP, and leaving the Windows desktop stationary! 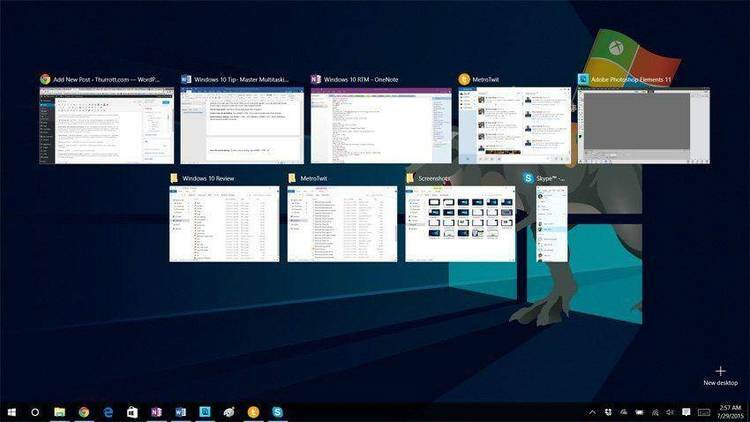 For example, if you drag the windows desktop to the right on the virtual desktop, you are really moving the virtual desktop to the left the same amount. Now, the virtual desktop DOES NOT EXIST, and in fact all you are doing is moving every window except the Windows desktop window and the virtual desktop window to the left (even to positions of negative offsets). Virtual desktop options may be set using the Set Options item on the Virtual Desktop system menu. The system menu is the one with the horizontal bar in it in the upper left-hand corner. All user controlled options are stored in vdesktop.ini in your Windows directory. The options over which you have control, and the effect of there settings is discussed below. Virtual Desktop SizeThe width and height settings determine the number of times wider and higher the virtual desktop will be than your Windows desktop. Both settings must fall in the range 1-8. This option defaults to 4 wide by 4 high. Align Desktop to GridThis option, when selected, will cause the virtual desktop window to show the rows and columns of the virtual desktop, separated by dotted lines. The Windows desktop will always be aligned to one of the "panes" in the virtual desktop. When disabled, the concept of rows and columns is completely eliminated and the Windows desktop may be positioned to any arbitrary boundary. This options defaults to enabled. Align Windows within n PixelsThis option only works when Align Desktop to Grid is also selected. Setting a non-zero number here causes windows that are positioned using the virtual desktop to be aligned to the nearest grid boundary when close enough. Vertical and horizontal alignment are independent, you can be close enough to one and not the other. This number is expressed in display pixels, a the default setting of 5 usually works well. Follow Active WindowThis option, when selected, causes the Windows desktop to be moved to the part of the screen containing the active window. For example, if you double-click the desktop to get the task manager and switch to a task in the list, the Windows desktop will move to a position where the new window can be seen. The Windows desktop will only move if no part of the newly active window is visible on the current Windows desktop. If "Align Desktop to Grid" is disabled, the desktop window will be centered on the newly active window. Otherwise the pane containing the window's center will be used. Also enabled with "Follow Active Window" is a short-cut feature for moving around the desktop. By double-clicking the left mouse button on an application in the Virtual desktop window, that application window will be activated, and the desktop will change position to show the window. In this case, the desktop will move to a better view the application, even if part of it is already visible on the desktop. This setting defaults to enabled. Keep Icons on DesktopThis option, when enabled, causes all icons to maintain their position in the Windows desktop, regardless of where the Windows desktop is position within the virtual desktop. When disabled, icons stay in their positions on the virtual desktop. This option defaults to disabled. Keep Virtual Desktop in FrontThis option, when enabled, causes the virtual desktop window to stay in front of other windows, even when they are active. This option defaults to disabled. Update Desktop each n msecsThis option determines how often the virtual desktop application examines the state of the virtual desktop and updates its window. Too large a number will make the display slow to respond to virtual desktop changes, and too small a number may have an effect on the performance of your other applications. Values entered here must be at least 50 msecs (update 20 times a second). The default setting of 500 msecs (twice a second) is suggested. Move windows to desktop on exitThis option, when enabled moves all of the windows and icons that are not currently visible in the Windows desktop to the the upper left hand corner of the desktop when the Virtual Desktop application is exited. This prevents you from leaving windows off of the screen. The default setting is enabled. Desktop PositionThe desktop position is considered an option by the Virtual Desktop software, even though there is no corresponding control in the options dialog box. Use the border of the window to size the window to your liking, and the title bar to move it where you want. The default setting for position is the middle of the Windows desktop and half of the Windows desktop size. You will almost certainly want to change this setting. The desktop options may be saved using the Save Setup item on the System Menu. These saved options will be used the next time the desktop is run. The Virtual Desktop does NOT automatically save these settings on exit. This is deliberate, it is too easy to mess up the desktop position accidentally with a tile or cascade command in Windows. It is recommended that you never close the virtual desktop application. If you do, other application windows may or may not end up being visible on the Windows Desktop. If the move windows to desktop on exit option is enabled, the Virtual Desktop program will guarantee that all windows are visible after exiting by moving any window that is entirely off the screen to the upper-left hand corner of the desktop. If you do not desire this behavior, the option can be disabled. Note, however, that this may leave windows off of the desktop with no way of getting to them other than using the task manager's tile or cascade commands. It is even possible to end up with no windows on the screen. In this case, the task manager can be activated by double-clicking the desktop with the left mouse button or by pressing Ctrl-Esc making its tile and cascade commands accessible. xxxx,yyyy are other applications that may already in the command. oThe virtual desktop window is now correctly redrawn after a double click activation of a window that did not result in a move of the desktop. oThe virtual desktop window is now correctly redrawn after dragging a window on the virtual desktop. oAttempting to drag an application window partly off of the virtual desktop to the left or the top was not possible when gridding was active. To be consistent with the Windows desktop behavior, this should have been and is now possible. oThe desktop color is now correctly selected. oAn option was added to move all windows that are not on the Windows desktop back to the upper -left hand corner of the screen on program exit. oWhen a new window was activated by a mouse click, and a virtual desktop move was deemed necessary by the virtual desktop program, the newly activated windows would end up in the wrong place. This was caused by competition between the mouse moving the window and the desktop moving the window. This was corrected by not allowing the desktop to move if any part of the newly active window is on the screen. If it is not on the screen, the mouse can't have activated it. oA new method of changing active windows was added. By double-clicking the left button on a window in the desktop, it becomes active. In this case, the virtual desktop can be moved even if the window is partially visible on the current desktop.